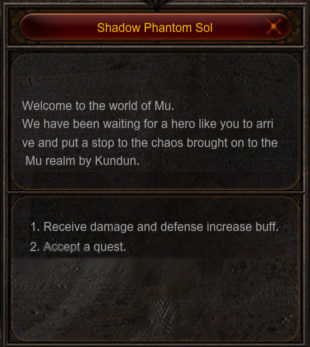 [Guide] [Quest] [Shadow Phantom Soldier] <+> [MU Online Fanz] <+> Official 3rd-party [MU Online] Fan Site & Game Guide! NPC [Shadow Phantom Soldiers], located throughout the continent, needs any help they can get. These soldiers have been trying to hold off the evil monsters being summoned by [Kundun], which now wander vastly. [Shadow Phantom Soldiers], for the last 2 years, have successfully maintained a few cities. Unfortunately, their now diminished forces are not strong enough to do it alone. They are recutting almost anyone left on the continent to help fight off [Kundun's] evil. By completing their requests, the [Shadow Phantom Soldiers] will guide you to become a great and knowledgable warrior! The [Quests] offered have various rewards, such as [EXP], [Zen], equipment items, or even [Jewels]! Each [Quest] has [Character Level] restrictions. An NPC will only offer a [Quest] to a character if it's within the [Character Level] restrictions. Some [Quests] offered by this NPC are repeatable. Sometimes the [Task] of each [Quest] varies by [Character Class]. NPC [Shadow Phantom Soldier] offers a free character [Buff], which increases [ATK DMG] and [DEF] greatly. The [NPC] [Buff] can be used at any time, and lasts for 60 minutes. The [NPC] [Buff] cannot be used past [Character Level] [Level 220]. In [Gold Channel Servers] the [NPC] [Buff] cannot be used past [Character Level] [Level 400]. These are the quests offered by NPC [Shadow Phantom Soldier] for characters up to [Character Level] [Level 260]! [Quest] list for [Character Level] [Level 1] ~ [Level 260]. Dispose of the Town Plunderers! Dispose of the Plunderers' Leader! Monster Supply Route in Devias! Attack on the Supply Corps! This [Quest] is NOT repeatable. These are the quests offered by NPC [Shadow Phantom Soldier] for characters between [Character Level] [Level 260] ~ [Level 350]! [Quest] list for [Character Level] [Level 260] ~ [Level 350]. 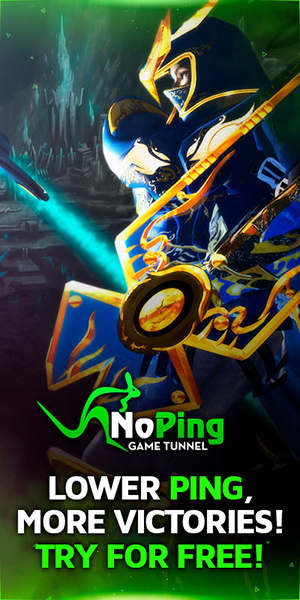 [Watchers of Kundun] [Quest] must be completed to obtain [Request from Shadow Phantom Unit] [Quest]. This [Quest] cannot be accepted while the [Request from Shadow Phantom Unit(1)] [Quest] is active. This [Quest] is unlocked after completing the [Watchers of Kundun(1)] [Quest]. This [Quest] cannot be accepted while the [Request from Shadow Phantom Unit(2)] [Quest] is active. This [Quest] is unlocked after completing the [Watchers of Kundun(2)] [Quest]. This [Quest] cannot be accepted while the [Request from Shadow Phantom Unit(3)] [Quest] is active. This [Quest] is unlocked after completing the [Watchers of Kundun(3)] [Quest]. These are the quests offered by NPC [Shadow Phantom Soldier] for characters over [Character Level] [Level 410]! [Quest] list for [Character Level] over [Level 410]. [Green Ink] can be obtained by killing [Berserker]. [Blue Ink] can be obtained by killing [Sapi Queen]. [Red Ink] can be obtained by killing [Bloody Orc]. [Parchment of Soul] can be obtained by killing [Dark Mammoth]. This [Quest] is unlocked after completing the [Deleting Memory, first(1)] [Quest]. This [Quest] is unlocked after completing the [Deleting Memory, second(1)] [Quest]. This [Quest] is unlocked after completing the [Deleting Memory, third(1)] [Quest]. This [Quest] is unlocked after completing the [Last Chance(1)] [Quest]. This [Quest] is unlocked after completing the [Last Chance(2)] [Quest]. This [Quest] is unlocked after completing the [Last Chance(3)] [Quest].